Escalante is a small town at the center of south Utah, surrounded by some of the most rugged yet beautiful country in the state. 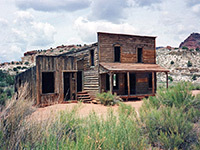 The areas to the south and east were amongst the last places in America to be explored and mapped, and have long been popular with adventurous explorers and back-country enthusiasts because of the countless spectacular canyons, badlands, cliffs, hoodoos, arches and other red rock formations, and the peace and solitude provided by the region. The land is lightly regulated; there is very little development, no entrance fee, few facilities, and free primitive camping is allowed almost anywhere. A small number of places have a maintained path, or a recognized trailhead, but for the most part, exploration is off trail, cross-country. 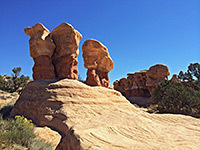 The area has been protected since September 1996 after the establishment of the Grand Staircase-Escalante National Monument (administered by the BLM rather than the NPS), which originally covered 1.7 million mostly roadless acres, bordered approximately by Capitol Reef National Park to the northeast, Glen Canyon National Recreation Area to the southeast, road UT 12 to the north, Paunsaugunt Plateau to the west and road US 89 to the south (see map). 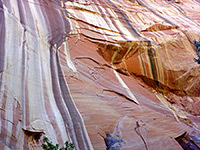 The principal attractions within the preserve are based around tributaries of the two major river systems - the Paria in the west and the Escalante in the east, around which are a series of escarpments of differently colored sandstone strata - the Grand Staircase - which extend to neighboring areas like Bryce Canyon, Cedar Breaks and the Vermilion Cliffs. The creation of the national monument was met with a mixed response, since the added protection and restrictions on further industrial development of the area were counterbalanced by the increase in visitation, with consequent problems of pollution and spoiling of the environment. Partly because of these issues, the monument was, in December 2017, split into three separate preserves, the Grand Staircase, Kaiparowits and Escalante Canyons units, totaling about 60 percent of the original area. 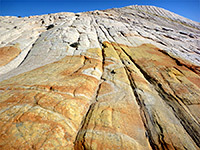 The western section of the national monument contains most of the Grand Staircase, a series of uplifted sandstone cliffs stretching in order of increasing age between Bryce Canyon and the Grand Canyon. 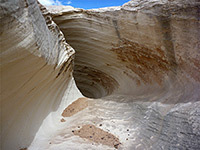 Cutting through the cliffs is one of the two major canyon systems; that formed by the Paria River and its many tributaries. The main access to the upper reaches of the river is by the 50-mile Cottonwood Canyon Road running between Cannonville and US 89; this is a bumpy gravel track that is often impassable after rains due to the clayish soils. 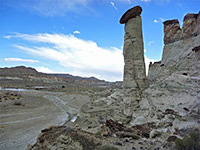 The most visited section of the river is towards the south, either side of the Hwy 89 crossing, where popular places include the Paria Rimrocks and the Paria townsite, while just outside the national monument are the Paria River narrows, the Buckskin Gulch slot canyon and the eroded features of Coyote Buttes and the Wave. Lengthy unpaved road through the national monument, also a useful short-cut between UT 12 (near Kodachrome Basin State Park) and US 89 close to the Paria River ranger station. 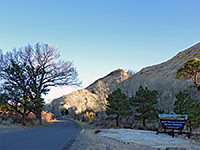 Tropic, Cannonville, Escalante and Boulder all have a few motels; the nearest places with chain hotels close to Grand Staircase-Escalante National Monument are Bryce Canyon and Torrey. 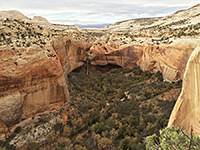 The largest canyon system in the Grand Staircase-Escalante National Monument is formed by the Escalante River. 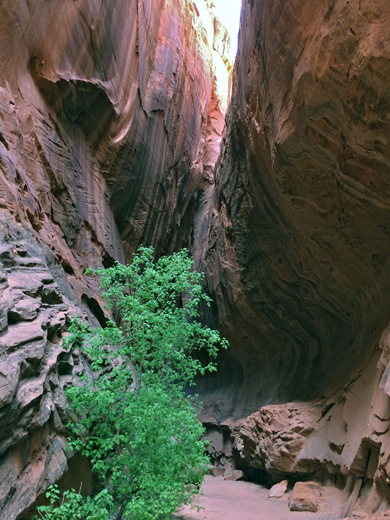 This, the last in all America to be discovered and mapped, runs through the small town of Escalante and then down a long canyon towards Lake Powell, en route joined by dozens of side-canyons, many of which are quite narrow and fascinating to explore. 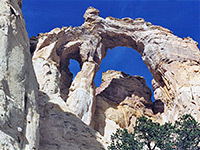 This region also has numerous natural bridges and arches, plateaus and ridges, but there are only two maintained access routes - the Burr Trail and the Hole-in-the-Rock road, and quite lengthy hiking is necessary to reach most of the interesting places. 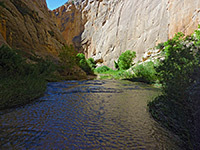 One alternative is sightseeing by boat from the lake, as the lower reaches of the Escalante River are flooded.